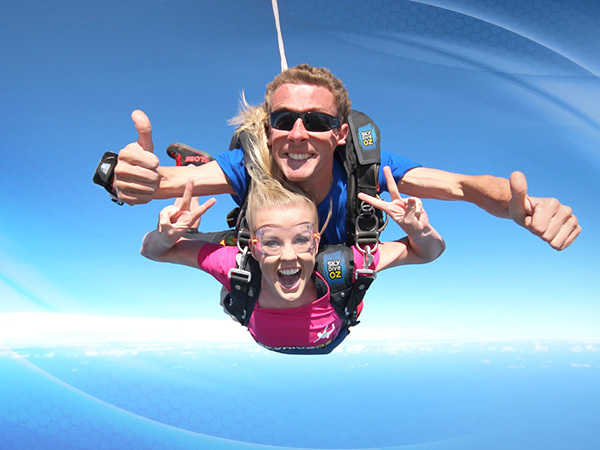 Embrace the fear, hop in the plane, soak up the sights, land after feeling the ultimate adrenalin rush: Skydiving Hay. You’ll free-fall at over 200 km/hr then enjoy floating down under canopy over the beautiful countryside for 5-7 minutes soaking up views. Setting down back to where you started this crazy adventure. We have a unique, fun and relaxed atmosphere to ensure you have the absolute most amazing experience possible. Book online by selecting an experience above or simply call 1300 185 180 between 8:30am – 5pm. Be aware for Hay NSW we require a minimum amount of bookings and suitable weather for the day to go ahead as scheduled. Don’t fear! in the event of a cancellation, any confirmed bookings will be refunded / re-scheduled. Don’t forget, you can get your whole experienced filmed so you can re-live all of the fun and excitement. Simply choose a video option during check out or decide on the day of your jump.